School Polo: Primary students wear green. Secondary students have a choice of white or green. As there is a wide variety of opinion on material preference, shirts will be available in both current forms (soft and knit) from Land’s End, and in a modern “dry-fit” fabric directly from the school. The shirts will continue to be worn with khaki shorts, trousers, or skirts. Polo shirts are also available from J&C Trading in Road Town. PE Kit: All students will wear a sporty lime, white and grey “dry-fit” shirt, which will have the Cedar logo centred on the upper back. The shirts come in both male and female cuts. Students will also wear grey athletic shorts branded with the Cedar logo. These will be available directly from the school. Students in Pre-K and Kindergarten wear the P.E kit for the whole day on P.E days. If the smallest available size for the shorts is still too big you may source your own unbranded sports shorts, as long as they are Gray. Outer Garment: Students can choose any grey outer garment from Lands End, so long as it is branded with the Cedar logo. The hoodie is pictured above, but cardigans, fleeces, and jumpers are also available. Formal Option: A formal option will also be available (but not required) for secondary students. This can be either a branded dress shirt without a tie, or a plain white dress shirt with a branded Cedar tie. These may be worn on designated days and may be required when representing Cedar at certain community events. Cedar Hats: Cedar hats will be available for purchase but not required. They will come in white, green, and grey. Land’s End: Polo shirts (knit and soft), outer garments, and branded white dress shirts. Parents will be able to continue to source direct from manufacturer, though the school will carry some supply. Click here to go directly to Cedar’s shop on Lands’ End. PE kits, dry-fit polo shirts, Cedar ties and hats are all available directly from the school. Please ask at the front office when you would like to place an order. Local Suppliers: J&C Trading (across the road from the high school in Road Town) will carry uniform Polos. Please click on the tab below to see the School Uniform policy in full. As part of the Cedar International School identity, all students are required to wear a school uniform as clarified below. Failure to comply with the uniform policy and dress code is considered a disciplinary infraction and will result in consequences according to the disciplinary code. Please label uniform items with your child’s name. Please note that hats must be worn by students from Pre-Kindergarten through Grade 5 when in the sun, for long-term safety reasons. Hats should be removed when inside the building, even on Free Dress Days. Type: Short-sleeved polo shirt with embroidered Cedar logo Color: Evergreen in Primary, evergreen or white in Secondary. Skirts/pants must be worn on the waist. Skirts/shorts must not be shorter than mid thigh. Cargo-style, painters’-style or oversized trousers or shorts are not acceptable. Neither are, tight-fitting trousers, shorts, or leggings. Types: Students can choose any grey outer garment from Lands End, so long as it is branded with the Cedar logo. Grade K-12 closed-toe shoes only. For safety concerns, heels higher than two inches must not be worn. No crocs or other similar footwear deemed inappropriate by the Director will be permitted. Students in Pre-kindergarten through Grade 5 must wear hats while on the field or playground. Secondary students in Grades 6 to 12 are encouraged to wear hats for sun protection. Students who do not wear an appropriate PE uniform will not be permitted to participate in class. 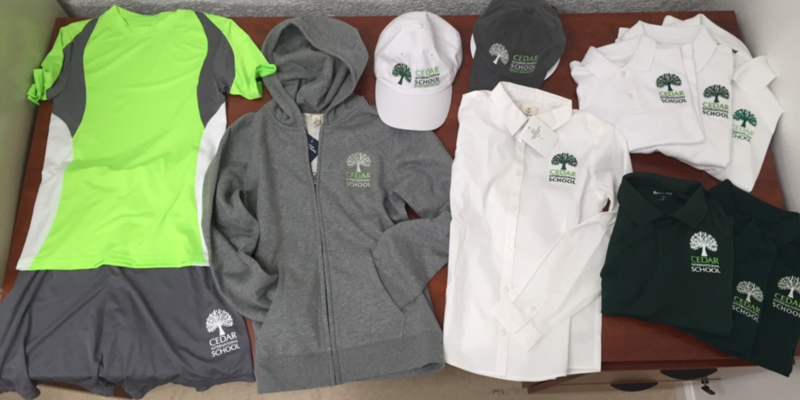 All students will wear a sporty lime, white and grey “dry-fit” shirt, which will have the Cedar logo centred on the upper back. The shirts come in both male and female cuts. Students will also wear grey athletic shorts branded with the Cedar logo. These will be available directly from the school. Students in Pre-K and Kindergarten wear the P.E kit for the whole day on designated P.E days. If the smallest available size for the shorts is still too big you may source your own unbranded sports shorts, as long as they are Gray. Skirt length must not be any shorter than mid-thigh. No over-sized trousers or shorts, or tight-fitting trousers, shorts, or leggings. The last Friday of the month is Free Dress Day, providing student attire follows the Grade 12 Student Dress Code. Closed-toe shoes only.